There are so many places in India that deserve our attention and are beautiful enough to be one of the most celebrated spots across the world. It is time we explore the unexplored, and tread into the territory that might be experimental but will be extremely fulfilling to the traveler inside all of us. India is full of places with historical relevance, natural charisma and spiritual value. It is our job to find them, locate them and then plan a trip to visit them. Hampi is one such place. It has become more known in the recent years with an outburst of young tourists trying to explore the beauty it holds within its grasps. There are many ways to explore Hampi, and we have tried to present a comprehensive guide to our readers so that they can plan without any trouble. This involves stopping over at a nearby city and making a day tour of the city that is Hampi. Fortunately, not very far from Hampi, around 6 hours away, is the bustling and the fun-packed city of Bangalore. One can easily find a good accommodation in this city and toping the Bangalore hotels list when it comes to great hospitality and luxury hotels, is The LaLiT Ashok, Bangalore. It will give you an experience that will refresh your mind and cleanse your soul, so that you are ready and rested for your exertions in Hampi! Hampi as a 1-day trip can be fast-paced and hectic. So, it is advisable to leave the hotel early in the morning (yes, as early as possible), so that one can reach Hampi before noon strikes. The main attractions of Hampi include Hemakuta Hill which has the Virupaksha Temple. You can also visit the Purandara Mantapa along with the Underground Temple and the Queen’s Bath to soak in the historical relevance of this site. Visiting all the places might not be feasible for a 1-day tour but the point is to get the experience in the best way you can and head back to the city in time for a lavish dinner in one of the many good restaurants in Bangalore. 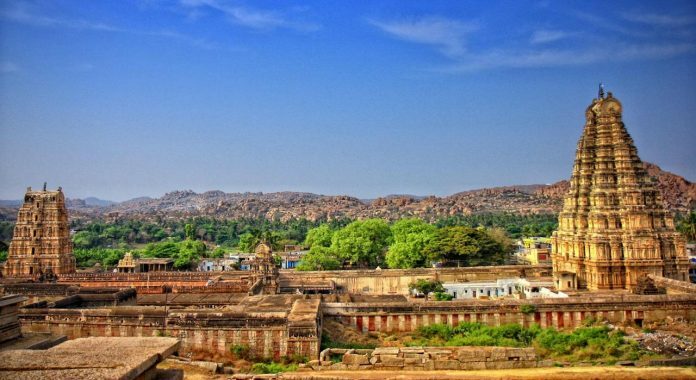 If you are going to be staying longer in Hampi, there is a lot more scope for you to explore and soak in the local vibes of the wonderful place. You can walk, rent a bicycle (this one is the most fun, to tell you the truth), take an auto-rickshaw or travel by car. You can cover the Sacred Centre surrounding the Virupaksha Temple vicinity. But the trick is to start from the Sasivekalu Ganesha pavilion on the Hemakuta Hill’s slopes. If you climb up further, you can explore the shrines as well. The exit of the Hemakuta Hill is through a massive tower. Once this is covered, you can head to the Hampi Bazaar. As you are staying for three days, it can be taken at a comfortable ease and you can spend more time in each of the aforementioned places. As everything is not very far from each other’s vicinity, directions are not usually problematic. Enjoy your stay and fill us up with your stories on your way back!